Hello! How was your Tuesday? Mine was ok. The best part was that I went to dinner @ my sister's house. She and her husband and the twins moved into their own place last weekend and this was my first chance to see it. It was also quite possibly the first time this sister has ever cooked a dinner for me. Sausage, peppers and onions...yum! The twins were adorable as always - it's always so fun to see how different their personalities are. I put this card together when I returned home a little while ago. I don't know why but I thought that the buttons could pass as crafty snowflakes. No two are the same...yeah. Well. It was an attempt! The words were cut with an old Sizzlet that I dusted off and put to use. Thank you so much for stopping by! I received this beautiful card from my friend today. My photography skills just don't do it justice. It caught my eye as soon as I walked into her craft room (a.k.a. La La Land) and I broke off mid-sentence to ooh and ahh over it. The hilarious part is that she was going to mail it to me and I ruined the surprise! The base of the card is always artichoke. 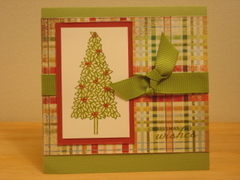 Layered on top is very vanilla along with a square of each of the always artichoke designer papers from SU. 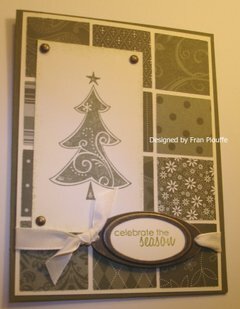 The tree image is from SU's Season of Joy set and the sentiment is from Papertrey Ink's Take a Bough set. Vintage brass hardware, vanilla taffeta ribbon, always artichoke and old olive inks round out the list of supplies needed to create this beautiful work. Here's a peek at what I've been working on lately. I know, I know, I'm stuck on this particular layout. All I can say is get used to it for a bit! I'm not big into snowmen, but this little guy is so cheerful it's impossible not to like him. I've modified the design a bit from other cards I've seen, but I was definitely inspired by cards on Splitcoast and on Valerie Stangle's blog. The base is stamped with white craft ink and the sentiment is done with basic black. It's not easy to tell from my picture, but I colored in the image using SU markers and then went over the brim and pom pom on his hat with a Copic Spica clear glitter pen. I've not found any in the craft stores near me, so I ordered my Copic glitter markers from Ellen Hutson LLC. After all the layering I punch pierced (I think I'm coining that phrase) each scallop to add interest and then attached the whole thing to the card using dimensionals. To finish it off I added two vintage brass brads. If you're like me you're hearing Huey Lewis's voice inside your head right now! Anyway, I was making Christmas cards and became 'stuck' in a rut. Every card began to look the same to me...and so I broke out and tried some 5.25" square cards. This one was fun to do. It's pretty self-explanatory, except for the tree. I followed Nichole Heady's example http://nicholeheady.typepad.com/capture_the_moment/countdown_believe/index.html, and after stamping the tree image using SU's Classic Old Olive ink I used an aqua painter to go over the image and effectively watercolor it. What you can't see from my photo (here's where I lament about my photography and editing skills) is that I colored the berries using an aqua painter and the ink from the top of my SU Crisp Cranberry inkpad and then went back over them with a clear glaze pen. It gave the tree image the perfect amount of interest. I distressed the Cranberry Crisp matting with my Cutter Kit, stamped the sentiment in Old Olive and used Old Olive grosgrain ribbon as my accent. My name is Maria and I love to craft. You name it and I've tried it at least once, probably twice. It all started one day when I was about four or so. My mom sent me outside to play and gave me the top to a gift box, a bowl of homemade paste (flour she mixed with water) and a pile of fallen leaves she'd had me collect from the yard. I glued the leaves to the box to make a collage and haven't looked back since. These days I'm hopelessly addicted to papercrafting. I still dabble in crochet and knitting (watch out family - more hats and scarves at Christmas this year!) but stamps, patterned paper and embellishments currently rule my world. While I have the best of intentions to scrapbook more I always seem to find myself making cards. And that's not a bad thing! 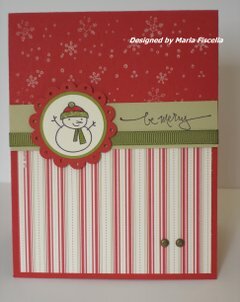 I am partial to Stampin' Up! (SU) images and products so you'll see a lot of them here, but I have begun a love affair with Papertrey, Bellas and Gina K, too. I am having so much fun mixing and matching across product lines!!! I am excited to try this whole blogging thing and share some of my card designs. While I'm confident about my designs, I consider myself a novice when it comes to photographing my work and navigating this blog space. And while I have to admit that I am stressing a bit about learning how to do this properly, I can't wait for the day when I can look back at this post and laugh at myself for my lack of computer savvy. Like, for instance, my lack of ability to get the date stamp out of this picture!!! My first major hurdle has been to learn how to watermark. I'm still trying out various software but all of the free trials have their own watermark imbedded in the trial software...and so I have the software designer's 'LAJ Design' stuck at the bottom of this photo! I thought I'd start with a Christmas card (timely, no?). I have been trying to get myself to use stamp sets that have been gathering dust lately. When I saw this Basic Grey Figgy Pudding paper I immediately thought of the little tree from Loads of Love. And this is what happened! I started with a 4.25" x 11" piece of SU Mellow Moss cardstock, scored it and folded it in half. Then I stamped the background stamp from Oh, So Lovely (SU) on the bottom using Always Artichoke Classic ink. Then I stamped the sentiment from SU Short & Sweet in Chocolate Chip. I secured the Basic Grey patterned paper using CM double-stick tape (fantastic stuff) and then tied on some SU Chocolate Chip taffeta ribbon, securing it with glue dots (LOVE glue dots!!). 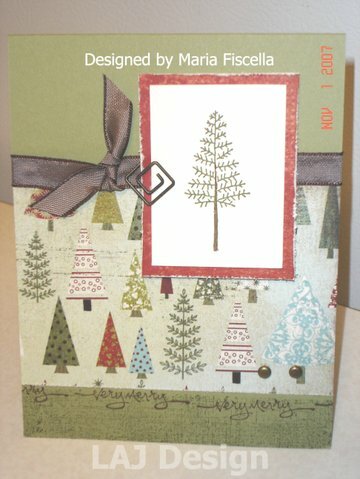 I stamped the tree image in Always Artichoke on white cardstock from Papertrey Ink, colored in the trunk using a brown marker and matted it on a Basic Grey Fruitcake scrap that I distressed using my SU Cutter Kit. I finished the whole thing off by adding a piece of SU Hodgepodge Hardware and two MM brads.